cone results and firing schedules. Free Test Cones! get a kiln on the way to you! Paragon no longer charges extra for custom colors. (The standard custom colors are berry, black, hot pink, jade, navy, purple, and turquoise.) You can have any kiln painted in one of these colors. This includes the painted switch box on stainless steel kilns. You can even order a pink Dragon. BUT NOW IT IS FREE!!! Yay! 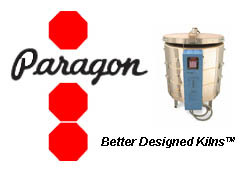 Need a Paragon custom kiln quote? for over 40 years - almost as long as Paragon has been in business!.